Nothing says 'summer in London' quite like Pimm's. 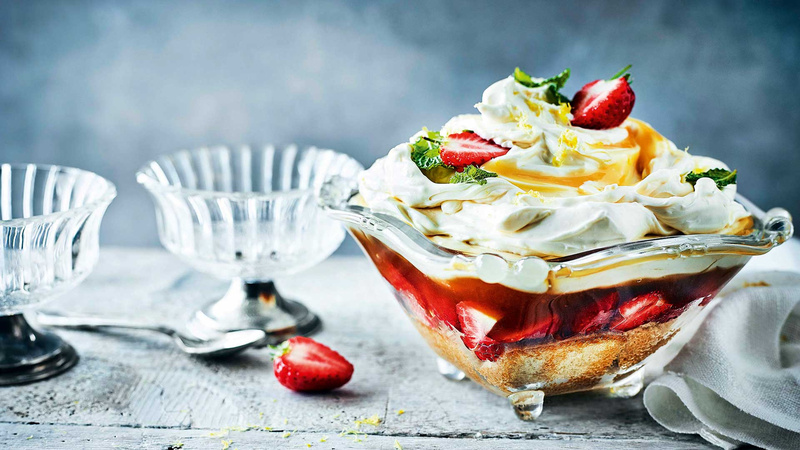 This recipe uses the liqueur to make a jelly for a proper English trifle, with lemon curd-infused cream. Put the gelatine leaves in a bowl of cold water and leave to soften for 5 minutes. Meanwhile, gently heat 200ml of the Pimm's with the lemonade, caster sugar and orange juice in a saucepan over a medium heat, until the sugar has melted and the mixture is just about to bubble. Squeeze the water out of the gelatine, add the sheets to the Pimm's mixture and stir until melted. Transfer the mixture to a bowl and put into the fridge for about 2 hours, until the jelly is nearly set. Cut the cake into thin slices, around 1cm thick, and use them to line the bottom of a large glass bowl. Pour over the remaining Pimm's and leave to soak for a few minutes. Quarter the strawberries lengthways and scatter over the top. Take your cooled jelly from the fridge and pour it over the strawberries and sponge. Return to the fridge for 1 hour to allow the jelly to firm up further. Pour the custard over the jelly, then whip the cream, mascarpone and icing sugar in a bowl until it forms soft peaks. Gently mix in the lemon curd and the lemon zest and spoon onto the custard. Decorate the trifle with the sliced strawberries and a few leaves of mint, if using. Chill until ready to serve.